There may be signs and symptoms your body is already telling you that you are pregnant even before confirming it with a blood test. If you think that you are pregnant and have any of the signs and symptoms below, taking a home pregnancy test and getting blood taken can confirm this. There is no harm in taking a home pregnancy test even if this time it is a false alarm. If the home pregnancy test is negative, although you continue to have strong pregnancy symptoms, consult a GP to have further blood taken as sometimes home tests can produce false-negatives. Happens as your breasts respond to the increase of progesterone in your body. A small percent of women bleed throughout their pregnancy although a missed period is most commonly associated with a woman being pregnant. Associated with the hormone changes during early pregnancy. Occurs once the egg has implanted into the lining of your uterus. Not all women experience implantation bleeding. This bleeding will happen somewhere between day ten and fourteen after fertilization. Often only lasts a couple of days and feels like a mild menstrual cramp. Caused from the rise in estrogen in the body. Many women experience vomiting during week six to nine of pregnancy. An increase of hormones flowing through your body make your bowel more relaxed sometimes resulting in constipation. Due to the hormone levels in your body along with added fatigue one may be happy one minute and crying the next during early pregnancy. Often only noticed if you are trying to fall pregnant as a chart of your temperature will show an increase several days after ovulation. An increase in blood flow in the body of someone who is pregnant may experience mild headaches. Caused by the increased supply of blood in your uterus along with your uterus growing and expanding. Direct result of a change of hormone levels in your body. 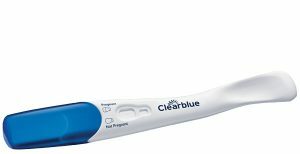 Clearblue offers pregnancy tests that have a 99% accuracy rate.